"Twas then we bid farewell to home, friends, & connections & took up the lines of march to meet the serried ranks of a strong but dastard foe." The 51st Virginia Infantry Regiment was organized at Wytheville, Virginia in August of 1861. It was composed of eleven companies from southwestern Virginia. The men of the 51st were from Wythe, Grayson, Wise, Patrick, Nelson, Bland, Tazewell, Amherst, and Floyd Counties. The vast majority of these men were farmers. The 51st earned an impressive record in many battles. It led the charge at New Market, a victory which saved the Shenandoah Valley, and therefore bought the Confederacy another year. The regiment participated in Longstreet's Knoxville Campaign, and was assigned briefly to Lee's Army of Northern Virginia while fighting around Richmond and at the bloody battle of Cold Harbor. It was also a vital part of Jubal Early's Valley Campaign and his famous raid on Washington. On March 2, 1865, the battered, depleted, and severely outnumbered 51st Virginia and the rest of Wharton's division was overwhelmed by Sheridan's Federal cavalry under Gen. George Custer at Waynesboro, Virginia. The majority of the regiment was captured and sent to Fort Delaware or Elmira, N.Y. The few soldiers of the 51st who escaped, served briefly under Gen. John B. Gordon at Petersburg. 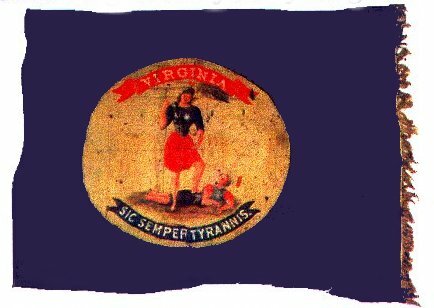 The beloved battle flag of the regiment was captured on March 25, 1865, in the attack on Fort Stedman. Proud member: Sons of Confederate Veterans. - Lt. Robert D. Powel, Camp # 1817, Blountville, TN.